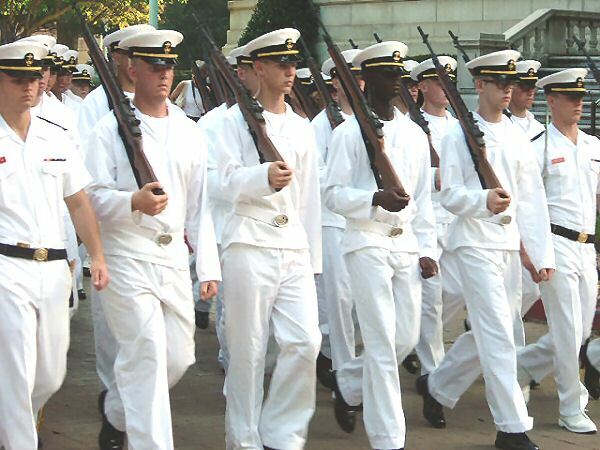 Plebe Parent Weekend–August | USNA or Bust! Plebe Parents’ Weekend is designed to offer parents, family members and guests an opportunity to visit with their Midshipman and experience a taste of the traditions, academics, and atmosphere unique to the Naval Academy prior to the start of the Fall Term. This year, Plebe Parent Weekend is mid-August. I can only imagine the excitement of those who are packing, planning, ready to see their Plebes after a long summer. How much will your child change? Will they still be excited about the USNA choice? Will they want to talk or sleep? I’m looking forward to reading everyone’s comments. For more information, visit the USNA website. The Naval Academy Visitors Center houses multiple displays as well as information about the historic campus. Freedom 7 Capsule: America’s first manned space capsule and one of the U.S. space program’s most valued artifacts was flown by the late Rear Adm. Alan B. Shepard (USNA 1945) May 5, 1961. This display is only available in the Visitor Center until Aug. 20, when it will be moved to the John F. Kennedy Library. John Paul Jones Exhibit: Come learn about America’s first naval hero and life aboard ship in the 18th century in this new exhibit. Handouts include a John Paul Jones timeline and a kid’s activity sheet. Historic Navy Flags: This exhibit of American naval flags flown from the American Revolution to present day will hang in the lobby of the Visitor Center through July. Handouts include an exhibit catalog, a list of flag holidays, a flyer on flag facts and information on where to purchase flags. The Naval Academy Museum, located in Preble Hall, is a must for anyone interested in naval history. The museum offers two floors of exhibits about the history of seapower, the development of the U.S. Navy, and the role of the U.S. Naval Academy in producing officers capable of leading America’s sailors and Marines. Speaking of history, take a walking tour of Annapolis to commemorate the War of 1812. This self guided tour will acquaint you with many of locations throughout Annapolis and the Naval Academy. Learn how the War of 1812 impacted our country and the development of the U.S. Navy. Visit the Annapolis Harbor, right outside Gate 1. With great shopping, restaurants and boat tours, there’s something for everyone. And don’t forget to cool off with some ice cream! You’re in Maryland, right? Eat crab. Stop in at the Annapolis Visitors Center at 26 West Street for even more ideas on how to enjoy this great historic city! Have a great time tomorrow, Cynthia!